It is not merely a train but combines the luxury of the world's leading hotels with the charm of train travel. 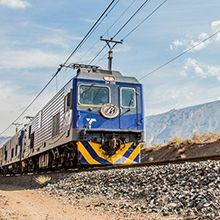 Think of it as an all inclusive luxury rail cruise with an opportunity to view South Africa's spectacular landscapes and visit interesting tourist attractions along the way. Take a journey into a timeless world of grace, elegance and romance, where spectacular scenery stirs your imagination and luxurious comfort soothes your body and soul. Sit back, de-stress and relax. This unique luxury recreation and business experience takes you where you want to go in an endless, five-star splendor. It pauses only to pick up prestigious World Travel awards for being a cut above the rest and the Diner's Club accolade for its connoisseur selection of South African wines. The Blue Train cuisine puts sheer good taste on a plate while butler personal attention puts you on a pedestal. It's a journey of a lifetime for those who appreciate finer things in life.